Edge to Edge quilting on your embroidery machine Expansion Pack has 10 new designs for the Easy-Connect Quilting technique explained in "Edge to Edge Quilting on your Embroidery Machine." Edge to Edge Quilting Expansion Pack 5. File formats include: ART DST EXP HUS JEF PES VIP VP3. Edge to Edge Quilting Expansion Pack 6. File formats include: ART DST EXP HUS JEF PES VIP VP3. 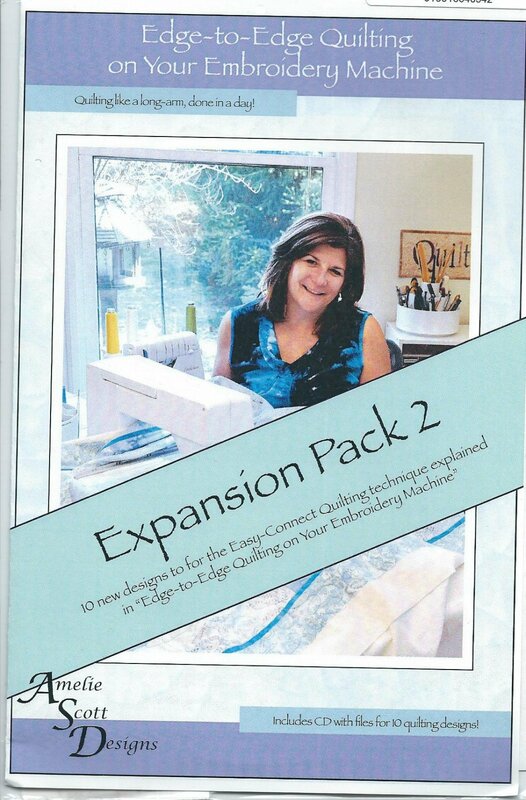 Edge to Edge Quilting Expansion Pack 7. This expansion pack provides 10 additional quilting designs to use with the Easy-Connect Quilting technique explained in our book Edge-to-Edge Quilting on Your Embroidery Machine. Edge to Edge Quilting Expansion Pack 8 from Amelie Scott Designs. This expansion pack provides 10 add'l quilting designs to use with the Easy-Connect Quilting technique explained in our book Edge-to-Edge Quilting on Your Embroidery Machine.